...on Pretoria Avenue, E17. Today. The BBC, true to its car supremacist traditions, made no mention of the recent cycling fatality in Greenwich. BBC London News ignored this violent death, just as it has ignored all the other cyclist/lorry fatalities in the capital this year and in 2008. The mass media plays a key role in naturalising road violence. It is not ‘news’, it just happens, like the weather. It is ‘an accident’. There is nothing anyone can do. Apart from the local paper and the London Evening Standard, this death seems to have passed unnoticed in the media. Yet this should surely have been a major story, for a number of reasons. Firstly, it was a violent killing. Why are knife killings news but not the killing of cyclists? Secondly, it was a hit and run killing. Jenny Jones, the only politician in London who seems to care about such matters, could have been interviewed. She says The Met Police halved the number of traffic police and regarded road safety as a very low priority. Drivers have spent the last decade or more thinking that they can break the law in London and get away with it. The result is that in some parts of London, a quarter of all people injured in traffic collisions are victims of hit and run drivers. Thirdly, the killing of women cyclists in London is occurring with sickening regularity. They are usually aged 25-40, are commuters, and are killed on the way to or from work, on routes they are familiar with and cycle every day. The higher proportion of women cyclists who die in accidents involving heavy goods vehicles in inner London cannot be explained satisfactorily. fewer women would die if more of them jumped red lights (keeping themselves out of the paths of HGVs). A controversial solution, but one I found myself sympathising with. Jumping red lights has got me out of far more sticky situations than it's got me into. But while BBC News continues to ignore the regular killing of London’s women cyclists, and all the issues they raise, it is obsessed with stories about motorists who get 'unfair' penalties for parking or speeding. So as far as the BBC journalists were concerned one of the major stories of the past week is that A council has been forced to apologise after a motorist found her car missing and double yellow lines put down in its place in south-east London. It was also big news on GMTV. On the Friday morning breakfast show there was an interview with the driver, and the woman presenter gigglingly confided to viewers that “I think I had three tickets in one week”. Which I think says it all. It's not wildly unreasonable to conclude that TV news reporters, most of them, drive flash cars, don’t cycle, have clocked up numerous speeding tickets and parking tickets, and think the number one transport issue is the war on the motorist. In the 19th century, cholera outbreaks that escaped from the slums to kill rich and poor alike caused the great Victorian revolution in public health. Fear of cholera ensured that vast sums were spent on building sewers and ensuring that everyone had clean water. Climate change is the cholera of our era. The NHS is gigantic and has a carbon footprint that is nearly one twentieth of the whole UK’s footprint — 1.3 million staff each with their own footprint, the drugs bought, the buildings, the transport, the water and the food, too much of it thrown away. The London Borough of Hammersmith and Fulham were at the forefront of the borough campaign to scrap the Congestion Charge Western Extension, and are keen on ripping out traffic lights and generally sucking up to the motorist. In light of that, perhaps it’s not surprising that monitoring air quality is taking a back seat. A politician has been accused of trying to discredit a demonstration held to highlight blind people's road safety fears. Kensington and Chelsea council's deputy leader Daniel Moylan sent an email suggesting one of the people on the rally was pretending to be blind. A WHEELCHAIR user has spoken of her disgust at dirty disabled toilets in an Epping car park. When Penny Pepper, 40, tried to use the facilities in Bakers Lane Car Park last month she was confronted a faeces-filled toilet, rusted sinks and peeling paint. But instead of complaining she took matters into her own hands and shamed the council on You Tube. The two minute video, called Toilet Trauma in Epping Town is set to a jaunty tune. Miss Pepper said: "I don't know if (Epping Forest District Council) still realise people use it." Miss Pepper is "embarrassed for the council" because of a sign above the door which reads "Invalid" . The term, previously used for disabled people, means useless. A festive custom we could do worse than foster would be stringing piano wire across country lanes to decapitate cyclists. Well it seems hypersensitive Matthew is not just upset by cyclists but has a new anxiety! Alfred Hitchcock was born at 517 The High Road, now better known as High Road Leytonstone. His father was a greengrocer and Hitchcock was literally born above the shop, just as Shakespeare was. Hitchcock’s movies are saturated with his childhood experiences in Leytonstone. He would wander up the road to see the travelling fairs on the open land beyond what is now the Green Man roundabout. He was an avid user of public transport, travelling all over the neighbourhood on trams, buses and trains. The family greengrocery gave him a lifelong interest in fruit and veg (watch out for it in his movies, along with shop scenes and food themes). Sabotage (1936) reconstructs the family home and locates it next door to a cinema, in an imaginative tribute to The High Road. The worst experience of Hitchcock's early life came when his father sent him to the local police station with a note saying he’d been a very naughty boy and would they please lock him up. Which the police did. It was only for five minutes but the experience fuelled all those films about innocent men falsely persecuted or imprisoned for crimes they haven’t committed. The experience also lies behind that scene in Young and Innocent (1937) where two constables chasing after a wanted man get a lift from a carter - who makes them get in with his cargo of honking pigs. Gosh, what was Hitchcock trying to suggest? Not far away from the family home was the grave of a victim of Jack the Ripper. Mix all that in with a strict, repressive Catholic upbringing and you have some of the central obsessions of Hitchcock’s movie-making. Here in the London Borough of Waltham Forest we are fortunate that we have a local authority with an established record of commitment to local history, culture and the arts. A pattern of well-marked walking and cycling trails encourage visitors to explore the many local sites associated with such famous people as Samuel Pepys, John Keats, Benjamin Disraeli, William Morris, and many others. But the jewel in the crown is undoubtedly the Alfred Hitchcock Birthplace Museum. When Hitchcock’s modest birthplace came up for sale, the council of the time moved swiftly to purchase it. Today, The Alfred Hitchcock Birthplace Museum, and the adjacent Hitchcock Study Centre, draws visitors and film students from around the world, eager not only to visit the birthplace of one of the twentieth century’s greatest directors, but also to see the local sites which meant so much to Hitchcock and which energised his entire film career. These days Leytonstone is more or less synonymous with Hitchcock, with numerous streets named after the great man and his films, the prize-winning ‘Hitchcock trail’ and the world-famous Hitchcock statue at Harrow Green. Of course some crap councils would have taken no interest at all in Hitchcock and would have allowed the house to be knocked down and the site used for a garage selling petrol and second-hand cars. But enough idle chatter. Here is the picture you have been waiting to see. The Alfred Hitchcock Birthplace Museum on High Road Leytonstone. And since every picture tells a story, note the sensitively located lighting column and the railings, perfect for making mincemeat of a cyclist when a passing HGV whose driver is being 'careless' or not paying 'due care and attention' or whose vehicle is held together by coat hangers, drifts into the cycle lane. And that BEST HAND CAR WASH sign really brightens up the walking environment, does it not? ...Paul Henderson is a cyclist. He missed out Advanced Stop Lines, though. When did the British stop walking? I have just worked out that when I was growing up I walked six miles most days without thinking about it. Is the car to blame? Is it as simple as that? Sometimes I think we don’t walk anymore because we don’t believe there is anywhere to go. No, Jeanette, the car is to blame. The car has even been allowed to intrude on the pedestrian’s last refuge, the pavement. Walking is devalued by our transport culture, which is addicted to cars and driving. Walking, like cycling, is never going to improve until cars are kicked off all pavements, forced to travel at speeds no greater than 15 mph in urban environments, and forced into a subordinate position in relation to walking, cycling, public transport and vehicles necessary for delivering goods and vehicles. The private car should come last in the transport hierarchy. It doesn't, there are no signs that this is going to change in any significant way, and so walking and cycling will continue to be marginalised. As a pedestrian or a cyclist I inhabit space which is not valued, which is often neglected, sometimes obstructed, involves diversions into filthy dark subways or bleak bridges, and which is influenced in every aspect by the hegemony of the motor vehicle. After the children found several skulls, police were called in and subsequently dug up 98 skulls and other bones, said Aligarh police chief Aseem Arun. Local government official Shailendra Singh said the remains were likely to be those of unidentified people killed in road accidents and other mishaps. HE ploughed head-on into motorcyclist Mark Gibbs when his luxury X-Type Jaguar drifted onto the wrong side of Epping New Road. He was convicted of causing death by dangerous driving in April 2007. He was very well connected. He was a chum of Britain’s most senior criminal judge, the Recorder of London Peter Beaumont QC. released after serving just three months behind bars. Cars had slowed right down to watch the mother and her eight ducklings cross the road and allow them to pass, but the charming scene turned into a horror show when a speeding Mercedes driver ran straight over the happy family. "Everyone had slowed down to let them pass. They were walking in a line and waddling across the road and it was lovely to watch. Then I saw this car coming at about 40mph, and he actually sped up to over 60mph as he came nearer to the ducks, using it like it was some sort of race track. I thought you're not going to do it, but as he got closer it was obvious he had no intention of stopping and drove straight over the top of them. It was horrendous." An ancient folk tradition in Waltham Forest is for the Council to paint thin white lines around disintegrating road surfaces. The origins of this enigmatic tribal art are lost in the dawn of time. Some anthropologists believe that it originated in 'telephoning to report a pothole' but as the white-lining is not followed by any action this is hard to believe. However, those who hold to this theory suggest that, having painted these mysterious lines, the highway engineering department then prays to the great God of Asphalt, who is a harsh deity who ignores all pleas for a safe, smooth cycling surface. Two examples. The first is outside 40 Forest Drive East E11, the second at the junction of the A112 and Queens Road E17. Just look at this idiot. He's NOT WEARING A HELMET. He's also NOT WEARING A HIGH-VISIBILITY LUMINOUS YELLOW LIGHT REFLECTING JACKET. 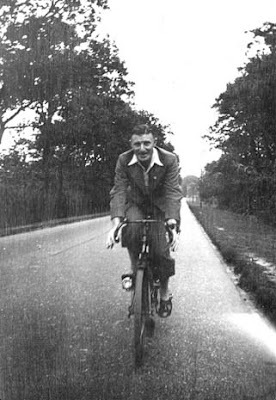 Dressing up in grey like that - it's hardly surprising drivers have difficulty in noticing cyclists, is it? And just look at those handlebars - a reckless speeder if ever I saw one. Even worse, look where he's cycling. Miles out from the verge. He's quite clearly provocatively trying to slow down motor vehicles. And what's he doing cycling on such a dangerous road in the first place? He's just asking for trouble. And look at that weird grin on his face. It's enough to make any driver feel threatened. I wouldn't be at all surprised if he was on drugs. A lot of cyclists are, you know. Your honour, I put it to you that although my client has been convicted of carelessness in knocking down Mr Smith on his bicycle while making an urgent appointment with her hairdresser on her handheld mobile phone at 85 mph, there is nevertheless overwhelming evidence of provocation, wilful recklessness and contributory negligence on the part of this cyclist, on a truly awesome scale. (pic from the Hampshire County Council archive. I would argue that cyclists are treated very badly in London because cycle campaigning is supine and ineffective. Energy is frittered away reporting potholes and lobbying for cycle stands. First, I think you're wrong to complain about energy being 'frittered away' by campaigns for cycle parking and potholes…it doesn't help anyone to belittle the efforts of people who actually succeed in making things better. We all want to save the world, but sometimes you have to do it one bike stand at a time. Second, I think you're right to suggest more direct (but, of course, peaceful and law-abiding) action. There is a lot of anger and it does indeed need channeling. Let me quickly say I’ve done all the dull stuff. I’ve written letters, met councillors, stood in the street with petitions. I've even done stuff that the London Cycling Campaign was not interested in, like make a submission on the consultation into parking enforcement in London (see this. Because yellow lines and parking enforcement are relevant to flawed cycle design like this, this and this.) But my parochial victories - modest changes to street lay-out and facilities - have been sapped by losing a wider war, which is that of increased car ownership, dependency and use. I successfuly campaigned for cycle stands at one local building used by the public, but cycling there is now worse than it used to be - more on-street car parking, a greater volume of traffic, the same reckless speeding. I very much doubt that those stands have really won anyone round to cycling. It seems to me that many cycling campaigners are not really campaigners. They organise bike rides and recycle bikes and run repair workshops and hand out maps, which are perfectly worthy activities. They dutifully report potholes and ask for cycle stands. But these activities can become an end in themselves, and evade the two key aspects which deter so many people from cycling: the sheer volume of vehicles on the roads, both parked and driven, and road danger. I think one reason why cyclists are very badly treated in London, is because cyclists put up with it. As an isolated and vulnerable road user you have no choice but I think the time for a spot of mass direct action is long overdue. And three of the most interesting developments on the London cycling scene – Critical Mass, the Naked Bike Ride, and Ghost Bikes – all seem to have emerged from cyclists working together outside the conventional campaigning organisations. I did once organise direct action against lawless motorists in a London street (not in Waltham Forest). I carefully selected the street, the time and the issue. I found someone to deal with the media. I spread the word. Lots of people turned up (as did the police). 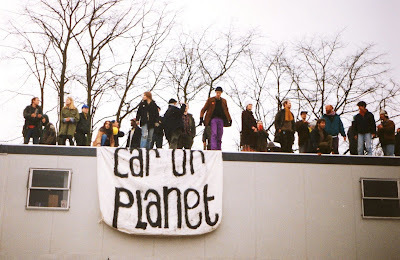 The action was a spectacular success, it annoyed lawless drivers, it flummoxed the cops, it got very wide media coverage (the media love direct action if it's visual). It inspired activists in other parts of the country to imitate it. And it even made the local council subsequently take positive action on that street. My protest was a great success in every possible way. But I'm afraid that strictly speaking it wasn't a law-abiding action. But then as we know from all those cyclists who go through red lights, ride on pavements and go along one-way streets the 'wrong' way, cyclists aren't necessarily in thrall to the law. Indeed, all those actions represent instances of one-person direct action. For weeks afterwards I was phoned by reporters begging me to organise a similar stunt, just for them. I had to explain that this sort of event isn't something you can just switch on like a tap. I was only able to do it because at the time I was involved and well-connected with activists who were happy to give me support. That network has evaporated with the passage of time. If I could summon up my army of supporters today I think I'd target New Scotland Yard. A couple of hundred cyclists blocking the road outside, demanding more traffic police, demanding that the same attention be given to stopping Heavy Goods Vehicles to see if they are in a roadworthy condition as is given to stopping people on the grounds that they look a bit dodgy and might be terrorists, enforcement of Advanced Stop Lines, greater action against drivers on mobile phones. Something like that. Then there's the possibility of a protest outside a court when a killer driver is allowed to walk free and a helmetless cyclist is identified as negligent. RoadPeace would probably help with something on those lines. In the digital age, organising mass protests is a lot easier. And for those who are too timid for direct action, let me mention one idea, not original. I was intrigued by the Bike Show’s idea of No Bike Week. In the event, I ignored it, on the grounds that I was sure everyone else would, and in any case a week is too long, but I like the concept. I suggest a modified version: No Bike Day. On that specific day – and to make an impact it would have to be a weekday, not a Saturday or a Sunday – all cyclists in London who were FED UP with a particular aspect of cycling (road danger, crap cycle parking, bike theft, whatever) would agree not to cycle. Those who owned cars would use them, to help clog up the roads. This protest could be keyed into any aspect of local cycling that angered cyclists. I think No Bike Day (call it what you will – No Cycling Day?) would be worth a try in gauging how dissatisfied London’s cyclists are, and about what. The day before there could be a mass cycle ride, on the theme of WE’RE NOT CYCLING TOMORROW. 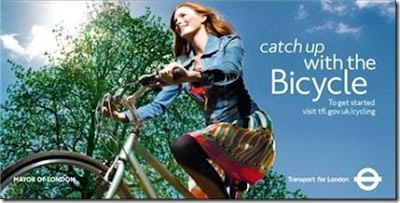 And cycle stands in London could have flyers taped to them, advertising it. I think it would be quite a simple thing to organise and it would hopefully attract the widest support as it is essentially non-confrontational. All it really requires is a suitably authoritative group of cyclists to decide on a date, well in advance, and spread the word to websites and bloggers. It needs a group to promote it rather than a solitary blogger, to give it credibility. It would help to have media savvy people involved who would get newspapers – national and local – and radio and TV involved in reporting it. Someone with design flair could make up a flyer for downloading and printing out. Cycling in London? On this particular day, for these specific reasons, I would prefer not to. The Bartleby approach. For that adventure holiday of a lifetime, why not participate in a thrill-packed cycle trek through the Waltham Forest badlands (home of the ferocious wild double-decker bus and minicab), across the Lea Valley jungle, into the remote wilderness region of Hackney? Please note that life insurance is required for cycling in Waltham Forest, machetes are essential when trekking along the LCC-recommended 'Orient Way Cycle Lane' and body armour is advisable when entering Hackney. Fred Oswald is among the leaders and lightning rods of an insurrectionist "LAB Reform" wing within the league. These self-proclaimed "Vehicular Cycling" proponents insist bike riders need no special facilities. They contend cyclists have the same rights and responsibilities as motorists, and that both can coexist on the same (undemarcated) roads given enough training, awareness and skills. Oswald maintains bike lanes and separate paths are just ways of consigning cyclists to "bike ghettoes" splattered with debris and broken glass. They're not for the benefit of riders, but to treat bikes as toys that should be kept out of motorists' way, he contends. The classic critique of the segregationist philosophy, in so far as it underpins ‘the London Cycling Network’, can be found here. I’ve argued against segregation myself, in relation to the Crooked Billet underpass. If you want more cyclists, you need to address such things as subjective safety and directness of cycle routes. Cyclists benefit a lot from being away from large numbers of cars. And far from the Council seizing back road space for cyclists and pedestrians it is actually doing the reverse. More and more parking bays are being created, invariably at the expense of the safety and convenience of cyclists. More and more streets are being converted to one-way streets, with no thought for cycling routes, purely in order to accommodate and manage increased vehicle flow. More and more pavements are being converted for legalized pavement parking, which encourages greater vehicle ownership and use, bigger cars, and faster driving on those roads. It also degrades the pedestrian’s last refuge, the pavement, and sends out a signal about who really counts in the transport culture. From my perspective in the suburbs, London is going backwards, not forwards. All of this raises the question, as the man said, What is to be done? I am still digesting all the interesting things cyclists wrote in Dave Hill’s Comments thread. I am also brooding on Rob Ainsley’s response to something I wrote on Monday, which caused a small red mist to form in his vision. I shall endeavour to fit all my thoughts together and write more tomorrow. The absurdity of the charge of ‘carelessness’ used against killer drivers is underlined by this case. It also vividly demonstrates the laxity of the judicial system, since this uninsured killer driver was released on bail, continued to drive after being charged, and was subsequently caught drunk at the wheel. Incidentally isn’t ‘drink driving’ itself a peculiar and sanitizing expression – it’s as if a pint of beer was steering the car rather than a human being. Why is ‘drunken driving’ never used? I suppose it’s because it was ‘an accident’ and ‘the tree was in collision with a car’. A man left his girlfriend to burn to death in a car after he crashed into a tree, a court heard yesterday. Arshad, of Luton, pleaded guilty yesterday to causing death by careless driving while over the alcohol limit, and causing death by driving while uninsured. The court also heard that Arshad had been arrested for drink driving while on bail following the incident. What are lorry sidebars for? That’s an easy question to answer. A lorry sidebar is there to stop a blind pedestrian from falling underneath the vehicle, when the lorry is parked across tactile paving by a zebra crossing. As this HGV was yesterday afternoon, on Forest Road E17 at the junction with Bedford Road. Further to my posts on the Boris near-miss here, here and here. The Daf driver had passed his details to a group of cyclists who had been in the road, and after clearing debris from the road he drove away. So we’ll never know if he’d been drinking or if he was chatting on a mobile phone at the time of the crash. The driver was interviewed under caution but not arrested. He was released after being reported for two motoring offences, driving without due care and attention and keeping a vehicle in a dangerous condition. But in driving at speed over a road hump in an attempt to get past a group of cyclists on a narrow road, the driver was plainly guilty not of carelessness but reckless and dangerous driving. The number of drivers in England and Wales prosecuted through the courts for 'dangerous' driving fell by over a third between 2003 and 2006, while the number of penalty notices issued for 'careless' driving offences (excluding the use of a hand held mobile phone while driving) was up 101% from 2005 to 2006. CTC believes this means that more and more dangerous drivers are merely getting a ticket for 'careless' driving, something that reinforces the impression that driving dangerously is not really a serious crime. I agree. The police and the CPS collude in protecting dangerous drivers. Though it’s a pity that there don’t seem to be any radical cycling lawyers. I think the distinction between ‘careless driving’ and ‘dangerous driving’ is, at it currently stands, unhelpful, and it would be much better to have a single charge of negligent driving, with penalties partly related to the consequences of that negligence. But the driver was perfectly aware that there was a group of cyclists ahead of him. He chose to put their lives at risk by overtaking in unsuitable circumstances. I can’t see that having a cycle lane painted in the road would have affected the driver’s behaviour one bit. Let's imagine that our ecstatic cyclist (courtesy of Saatchi and Transport for London) was going to do a spot of shopping in Walthamstow's legendary High Street market. She cycles into Mission Grove E17, where there are four stands alongside the bakery on the corner with High Street. Last Saturday afternoon this is what our blissed-out cyclist would have encountered. (Below) The first of the four stands, with a market trader's cart locked to it. (Below) The second cycle stand. A market trader's folding cart is locked to the front of the stand, with another section wedged behind it. (Below) This is the third stand. Another cart, locked to the stand with a bike-lock. (Below) The fourth and final cycle stand is buried away behind a fly-tipped metal panel. The brand new leader of Waltham Forest Council is Councillor Chris Robbins. I happen to know he is a cyclist, because he once pedalled past me going the other way, and I thought to myself: That’s Councillor Robbins! He won’t know this blog exists, so if you feel like communicating with him about the regular obstruction of cycle stands at this location, or any of the other local issues highlighted in these posts, you can find his contact details here. He represents himself as a decent, reasonable bloke. See if he replies to your email. See if he makes a difference. A global drive to improve energy efficiency will be the centrepiece of President Obama’s strategy for fighting climate change, the US Energy Secretary has said. But ‘energy efficiency’ is only a tiny part of the answer, and is plainly being projected as a saccharine substitute for meaningful but unpopular action against car dependency and flying. This is underlined by the involvement of the Prince of Greenwash. Wastefully burning electricity for illumination, outside on a bright afternoon. It doesn't get more pointless than that. For environmental irresponsibility The London Borough of Waltham Forest sets a very bad example. But needless to say it also touts 'energy efficiency', urging residents, Turn off lights when they aren’t in use and you could save up to 10% of your energy bill. But if you are a local authority, don’t worry, you can just put the council tax up again! The day before, walking along the path off Church End E17, leading to Church Hill Road, I encountered this lighting column, blazing away at 3 pm on a bright sunny afternoon. The mayor and an entourage - about 10 cyclists or so - were looking at options for a new cycle route - as a curious fellow cyclist I tagged along as I was on my way in to work in Canary Wharf following the same route. The back doors of the lorry flew open as it overtook us and the bolt on the right-hand door picked up a parked car through its front windscreen and swung it round at head-height, brushing past a few of the cyclists and then landing it back on all four wheels a little further down the road. (i) Looks a lot like the truck driver was travelling at a negligent speed - the doors clearly came unhooked as a result of his passing over the speed hump at a considerable pace. I saw the footage on BBC News, there wasn't enough room for the lorry to safely pass. its crazy that drivers are allowed to get away with this kind of recklessness on a daily basis. It’s bigger fines and longer jail terms are needed, as well as cycle lanes. Just curious why the Mayor was reviewing routes in Limehouse and didn't invite Tower Hamlets Wheelers the local campaign group along, we could have shown some of the major problems in that area. I am sure everyone who cycles along Narrow street in Limehouse daily like me is not surprised of what happened today. Daily, we see crazy lorry and van drivers going full speed downhill, invading the opposite lane even in the narrowest bit of the street where there is little visibility of whoever comes in the opposite direction or might be just in front and riding a bike at much lower speed. Since, amazingly, no one was injured, this crash will not enter the casualty statistics for 2009, by which ‘road safety’ is measured. And so this road will ‘scientifically’ be established as safe. A careful cyclist cannot meaningfully measure by statistics the risk they are exposed to on the roads. It is ultimately a matter of chance – of being in the wrong place at the wrong time. The roads are filled with very dangerous drivers and the streets are full of evidence of crashes. But only a minority of crashes involve physical injury or death. And when a car or cars collide it is a matter of chance whether or not a pedestrian or a cyclist is in the vicinity. If they are, they may die or be injured. A minute earlier or a minute later can make all the difference between a collision or no collision, between injury or death or another day of cycling. All kinds of random factors influence whether or not cyclists will be affected by the very considerable road dangers which are all around them on the capital's streets. London cyclists are daily exposed to danger and the threat of serious injury or death by risk-taking drivers who ought not to be on the roads. But those risk-taking drivers are protected by the structures and institutions of our society, which include the Metropolitan Police (corrupted by car supremacism at the highest levels, obsessed by theft of or damage to vehicles and largely indifferent to lawless and dangerous driving), the judicial system (which treats the wilfully negligent use of lethal machinery as a trivial matter) and the corporate mass media (which designates road crashes as ‘accidents’ and rarely regards them as being newsworthy, thereby trivialising widespread anti-social behaviour and extreme violence). Unfortunately cycling campaigning in Britain lacks a holistic approach and evades what might be called the politics of cycling. We need (to give just one example) mass cycling protests outside courtrooms, to protest about those judges and magistrates who let killer lorry drivers breeze out of court with a small fine, or who claim that cyclists who are run down and killed without a helmet are guilty of ‘contributory negligence’. I would argue that cyclists are treated very badly in London because cycle campaigning is supine and ineffective. Energy is frittered away reporting potholes and lobbying for cycle stands. The solution lies with London’s cyclists. Read the comments boxes on blogs and newspapers and it’s plain that there are lots of angry cyclists out there. But, as yet, that anger is not being channelled into any effective campaigning. Walthamstow's oldest church, dating back to the twelfth century, is St Mary’s. A window in this historic building has recently been enhanced by this attractive notice. This sign is fully in keeping with local church traditions, as each Sunday people gather in this ancient building to celebrate car dependency and exhibit religious indifference to pedestrians. The church website has contact details if you want to congratulate Simon on both his devout commitment to the material world and his aesthetic sensitivity as steward of this building. You could also ask him why the church does not provide cycle stands. I asked him for his name and number. He said he didn’t have a pen, so I gave him my pen, then nothing to write on, so I gave him a business card. He wrote down a name and number, handed the card back and kept the pen. If I hadn’t been so dazed and confused I would have jotted down his number plate. Several good Samaritans retrieved my stuff from the road -- my smashed iPhone, my broken glasses, my buckled bike. An ambulance arrived and I got in, followed quickly by the police who had just arrived. They asked if the driver who’d hit me had stopped and I said he had and gave them the card. They tried calling the number, but got no reply -- and the paramedic said he’d seen him scurrying off when the police arrived. The paramedic then did some rudimentary tests to make sure I was still compos mentis while the police took a statement. When I told the WPC I worked for the Standard, among other papers, she said, “They’re always having a go at us.” To defuse the situation, I told her I used to be the restaurant critic, at which point she asked me if I could recommend any restaurants in Notting Hill. Slightly odd, considering blood was still gushing from my forehead. That Boris Johnson near miss. Velorution has the video and offers some analysis and criticism. London Cyclist has the footage with a bit extra from BBC TV here. This footage doesn't exactly establish the case for safety in numbers, does it? David Higgins, the chief executive of the Olympic Delivery Authority, said that the perimeter fence’s power top, similar to electric cattle fencing, would produce a short, uncomfortable shock but insisted that it would not present any danger to the public or wildlife. (Below) The Olympic Greenway which runs past the stadium was until recently called The Sewer Path. Here's why. Not that you need to spot this historic notice board to understand why. Just a pair of nostrils. Yup, there's a strong and unmistakeable stench near the pedestrian entrance to the stadium. Will 2012 become known as The Year of the Stinking Olympics? I assume these pipes which disappear into the 'Olympic Greenway' are part of the sewage system. (Below) The towpath which runs alongside the Olympic site. It's far too narrow for a route which is very popular for leisure walking and cycling. Sections of it are in a poor condition, with a crumbling uneven surface and loose gravel. The Olympic project provided the ideal opportunity to upgrade this route, widen it, and provide a good quality surface, with benches. The total cost of the Olympic Park currently stands at £1.095 billion, funded by the taxpayer. And how much is going to be spent on this towpath? I think we can all guess the answer to that. 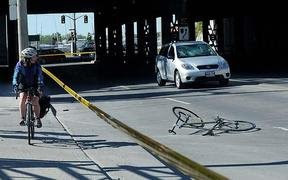 Although fatalities are rare – one or two a year – the rate of cycling collisions has remained stubbornly stagnant for the past decade: between 1,100 and 1,200 annually, according to city statistics. That might be good news, given the growing ranks of cyclists in the city. But per capita, Toronto has the most such collisions of any major Canadian city. And it's likely many incidents go unreported. TOUGH new laws that will see rogue cyclists jailed are expected to be introduced in Victoria by the end of this year. Fines of more than $13,000 and jail terms of up to a year will be given to cyclists convicted of "careless" and "dangerous" riding. 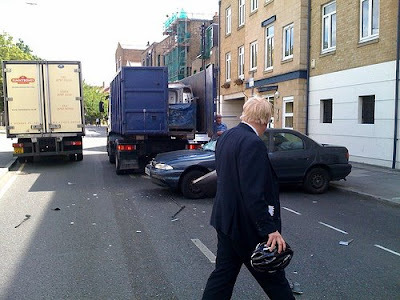 The Mayor of London, Boris Johnson, had what was described as a "near-miss" with a lorry while riding his bicycle in east London. 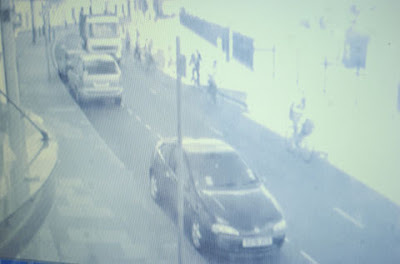 The incident, caught on a private security camera, happened as the mayor cycled in street in Limehouse. As a lorry overtook him its back doors flew open and hooked the windscreen of a parked car, dragging it for several yards before smashing into another. Kulveer Ranger, Johnson's director of transport, was left shaken after narrowly escaping being hit. The Tesco superstore in Leytonstone has parking for ten million cars and four bicycles. When the cycle-friendly London Borough of Waltham Forest gave the superstore planning permission, they cleverly understood that since cycling is complete crap locally no more than four cycle stands would be necessary, so that was all they insisted on. Providing more than four stands would also be very expensive for this financially strapped retailer. After all, Tesco today said it had rung up sales of £1bn a week and annual profits of more than £3bn for the first time in its history. The profits haul - believed to be the biggest ever for a British retailer - came after UK like-for-like sales grew 3 per cent over the year, with growth in the fourth quarter of 2.7 per cent. Anyway, Tesco is not in any sense Green, so any cyclists who shop there deserve to be punished. Our local council has been working hard to improve access to buses for the less mobile amongst us - wheel chair users for instance - by building raised kerbs at bus stops. Here's one on the A367 between Radstock and Peasedown St. John, Somerset. Note the beautifully laid rectangle of tarmac behind the raised kerb so that users can get on and off their bus with little difficulty. Note, also, the surrounding terrain. And the bus stop is 100 yards up the road. 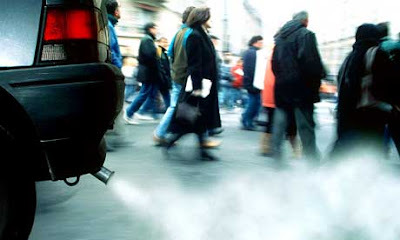 In cities, SUVs are loathed by everyone except the people who drive them; and in a city the size of London, a few dozen people could in a short space of time make the ownership of these cars effectively impossible, just by running keys down the side of them, at a cost to the owner of several thousand pounds a time. Say fifty people vandalising four cars each every night for a month: six thousand trashed SUVs in a month and the Chelsea tractors would soon be disappearing from our streets. An admirable call to action. And now it has begun! Environmental activists have carried out a spate of attacks on 4x4s under cover of darkness. Tyres have been let down or slashed, with notes left on motorists' windscreens accusing them of contributing to climate change. More than 100 so-called Chelsea Tractors have been targeted in recent weeks in wellheeled suburbs of South Manchester. I have no doubt that the car supremacist Greater Manchester Police, with its pro-road danger tradition, which is quite prepared to tolerate the distress and nuisance caused to pedestrians by obstructive pavement parking in Manchester, will put enormous resources into this case. If the perpetrators are caught and successfully prosecuted, our car supremacist judiciary will doubtless hand out very harsh sentences indeed, far tougher than the average killer driver gets. After all, 4X4s are the kind of vehicles judges and senior police officers own. I do wonder what offence someone has committed who, without causing damage, simply lets the air out of the tyres of a 4X4 which has been unlawfully driven on to the pavement and unlawfully parked there? I don’t suppose Detective Inspector Moron has spotted that little contradiction. As many as 1,000 protestors took to the streets in northwestern China after police officers allegedly beat a cyclist for running a red light, state media reported Thursday. The angry mob in Huining county, Gansu province, overturned a police car late Tuesday before around 100 backup police arrived, the Global Times daily newspaper said, citing witnesses. Ten police officers and government officials were injured as the crowd threw bricks at them, according to a statement posted on the local government's website Wednesday. Around 200 protestors then moved to surround government buildings and did not disperse until midnight, the statement said. Witnesses said the protest was triggered by some traffic officers beating a 19-year-old man after he failed to stop at a red light, the Global Times said. Another foreign killer driver evades justice. She killed a cyclist, did her best to evade justice, and was finally allowed by the judiciary to do just that. Woolwich Crown Court finds a Russian millionairess guilty of causing death by dangerous driving and perverting the course of justice. After an unprecedented trial in her absence, Natale Galogre was handed a 10-year jail sentence. Galogre had been at a party at the House of Commons with the high and mighty hours before she mowed down a cyclist. She was granted bail at an earlier court hearing and subsequently fled to Russia. Which judge, judges or magistrates granted this woman bail, bearing in mind the extraordinary lengths she went to to evade prosecution in the first place? As there was a good chance of her being found guilty of serious offences meriting a lengthy jail sentence, and in view of her attempts to elude justice, and the fact that the accused was a foreigner from a country with no extradition treaty, I simply do not understand why she was given bail. And no journalist has bothered to ask any of the kinds of interesting questions this case raises. Who was this woman being entertained by at the House of Commons before she drove off drunk in her 4X4 and mowed down a cyclist? Was the indulgent treatment of this well-connected criminal in any way related to the fact that Natale Galogre is famous in London for glamorous parties, that she and her brother Igor Galogre, Georgian businessman, often give in their London apartment. No one has enquired. And as far as I can tell, not a single national newspaper covered this case. 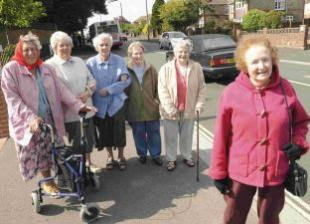 PENSIONERS are upset that a crossing on Weymouth’s busy Dorchester Road will be delayed. Elderly residents have to dodge speeding traffic as they go about their everyday tasks, like catching the bus or going to the shops. After months of delay, the pensioners were celebrating the news that a new puffin crossing – a sensor-activated crossing with traffic lights – was due to be installed near the police station on June 22. But their delight has turned to dismay when they discovered that it is being delayed for another four months. My recent file-clearing exercise yielded this cutting from wfm, dated December 2003. It shows the portly figure of council leader Clyde Loakes, pointing at a speed reactive sign, with the revelation that the new signs are 'part of the council's ongoing clampdown on speeding drivers'. Now these advisory signs, which are solar powered and flash when a driver exceeds the speed limit, are better than nothing at all, but in no sense do they involve GETTING TOUGH ON SPEEDING or form part of a clampdown. A driver who chooses to ignore the sign suffers no consequences. In reality these expensive signs are just another symbol of the blood-drenched farce of the road safety industry, and how road safety ideology is cynically designed to create the appearance of dealing with road carnage while evading its causes and permitting it to continue. For example, these signs do not contain a counter registering how many drivers are speeding over a 24 hour period. The results would be too embarrassing, of course. Just go along to the solitary speed reactive sign on Fulbourne Road E17 and watch it flash hundreds of times a day as drivers flout the 20 mph limit and speed past two primary schools. The same thing occurs on Fairlop Road E11. If you want to stop drivers from breaking the speed limit three things need doing (i) stop building cars designed to break speed limits and which encourage drivers to break speed limits (ii) fit the technology which forces vehicles to obey speed limits (iii) introduce severe penalties for speeding instead of treating it as a minor offence which can be indulged in four times before the driver loses their licence. Needless to say the influence of the road lobby ensures that such solutions are literally inconceivable in any political party apart from the Green Party. As usual with this crap council, once the spin has glittered and faded, and once the froth has popped, the reality kicks in. And the reality is that most of these signs no longer work. 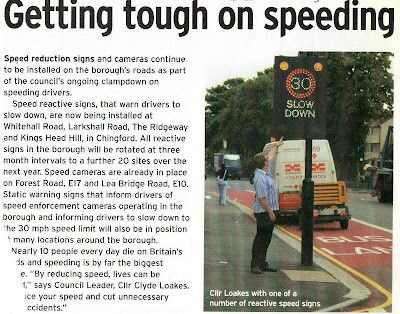 Forest Road, Chingford Road and Lea Bridge Road all have speed reactive signs which gave up the ghost years ago. 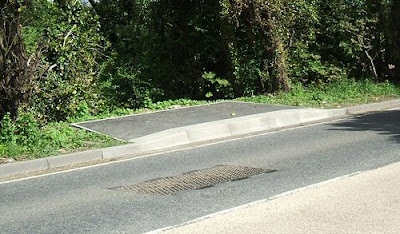 To be honest, I don't think anyone in this crap council has even noticed. The one shown below, on Lea Bridge Road, is just one of very many non-functioning signs. It's been pushed round and the speed sensor is not even pointing in the right direction. The money wasted on these ineffective signs must have been phenomenal, but who cares? They created the false impression that speeding was being tackled on these fast major roads, when it wasn't. Drivers still race down them and crashes still regularly occur. As for Clyde Loakes. He has just stood down as Waltham Forest council leader in order to fight a Conservative seat on behalf of Labour. Clyde shrewdly realises that at the next general election there is going to be a massive swing to the party of the brilliant and charismatic Gordon Brown. Ominously, Clyde says “Everything I have learnt over the past 6 years as a council leader in Waltham Forest, I know I can put to work for the benefit of the town and people of Northampton.” And what a record of achievement! What does worry me is that we are bringing up a generation of youngsters who believe it is all right to cycle and text whilst going the wrong way down a one-way street. 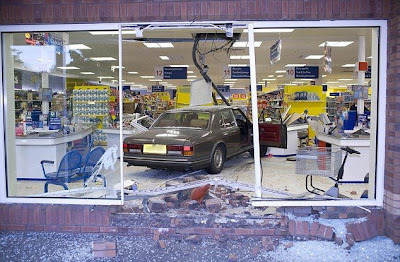 Shoppers at a Tesco superstore had to dive for cover when a motorist drove a Rolls-Royce straight through the store window and demolished checkouts. Minutes earlier the 50-year-old man had tried to buy alcohol at the supermarket but staff refused to serve him because they claimed he was already drunk. Transport for London (TfL) is the local government body responsible for most aspects of the transport system in Greater London. TfL is controlled by a board whose members are appointed by the Mayor of London, a position currently held by Boris Johnson, who also chairs the Board. The Commissioner of Transport for London (Peter Hendy since 17 January 2006) reports to the Board and leads a management team with individual functional responsibilities. Now I have to confess I was unaware until yesterday that TfL had a ‘Cycle London’ web page with recommended links (43 at the last count) to “People, groups or organisations who bring others together to talk cycling or get cycling”. Looking at the list, it’s a very patchy one. For example, it doesn’t include, as it should, Real Cycling. Some of the sites listed are business sites, selling services. The definition of ‘London’ stretches to include a site promoting cycling in Godalming (four miles south of Guildford) and Haslemere (12 miles south west of Guildford). I definitely spoke too soon about the lovely weather that gingerly peaked around the corner and dipped it's toe in the water! Well, it found that the water was far too cold and ran away again! It has been a week of battling against a serious headwind and being lashed by rain showers just like it was winter again! Come back spring all is forgiven! A friend of mine, who I shall call J, contacted TfL and suggested this blog should be included. After all, it describes the daily experiences of a London cyclist and expresses views on a wide range of issues relating to cycling. Thank you for suggesting a link for the Your links section of the Cycle London web pages. Unfortunately, we are unable to publish this link because it is unsuitable and breaches our moderation guidelines. Thanks for your reply. In what sense is this link unsuitable? Do enlighten me more about your guidelines. Cycle London has not replied. Now frankly I couldn’t give a toss whether or not TfL include this blog on their links list, so I shall not be angrily emailing Boris to complain. The response simply underlines my belief that cycling in the UK is going nowhere, because all those institutions ostensibly involved in promoting it are in denial. What counts is spin and spurious good news rather than the reality, which is that the cycling infrastructure is crap and that cycling is, much of the time (and depending where you cycle), dangerous and unpleasant. In support of this thesis I simply refer sceptics to the photographs on this blog. If there is really going to be a massive increase in cycling it will require both a radical new approach to road lay-out and a radical new approach to road danger. I see not the slightest sign that either are going to be seriously addressed in the near future, nor do I believe that the three main political parties in Britain have any such commitment. Having cycled in the rush hour a couple of times recently, it is remarkable the extent to which London has become a cycling city, despite the fact that cyclists are barely tolerated let alone catered for . There are cyclists everywhere and they now form a substantial part of the traffic in central London and yet, for the most part, they are still treated as pariahs. I would like to dedicate the next song to TfL and to everyone who believes that there has been a 91 per cent increase in cycling in London, and that everything is getting better and safer for cyclists in the best of all possible worlds. This song is about the difference between spin and reality - and I think of it as being about London's cycling infrastructure. A BARNSTAPLE mountain biker who last week set off on an epic charity cycle ride around Europe has been dealt a massive blow. Just hours after reaching French shores, his adventure took a major setback after he was knocked off his bike following a collision with a car. 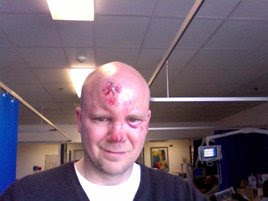 "The car just ploughed into the back of me; the driver left a bumper behind but didn't stop," Chris told the Gazette. How many years does it take a cycling officer to change a light bulb? 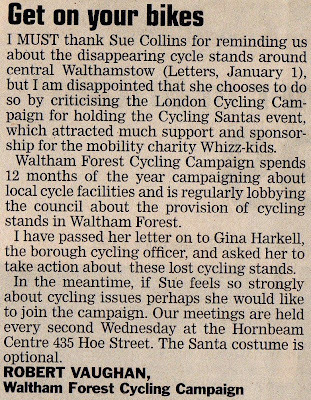 The letter is from the issue of the Waltham Forest Guardian dated January 29, 2004. And how many of the missing cycle stands which Ms. Collins complained about have been restored in the five years and three months which have elapsed since that time? I borrowed some of the information from Ms. Collins’s original letter and added some missing stands of my own back in September 2007, noting That's a grand total of 15 cycle stands which have been removed. Since that date I can add two more. This cycle stand in the Town Square has now vanished. And this one on Hoe Street was removed last September and has never been put back. So that’s a total of 17 cycle stands which have vanished from central Walthamstow. And now here's a song about cycling infrastructure in London. How safe is London for cyclists?